Meet CALVIN. 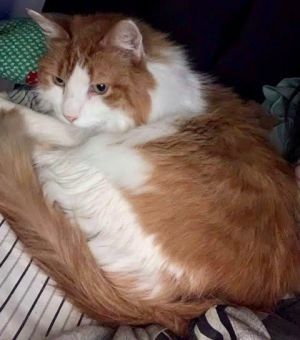 He is a really GOOD-LOOKING 10 year old MEDIUM hair, orange and white TURKISH VAN mix. We took him into our shelter after it was determined that he and his housemate weren’t getting along so well. Calvin is VERY AFFECTIONATE and loves to give HEAD BUTTS and put her paw on you. If you do not comply, he will gently place his paw somewhere on your body seeking ATTENTION. Calvin really likes being BRUSHED. He keeps himself immaculately clean too. He’s also a tad independent. Calvin would be fine as your “One and Only” or he can live with other cats after a slow and proper introduction. Would you like to meet Calvin? He is being fostered in Long Beach, NY. He is neutered, UTD on shots, and FIV/FeLV negative.